This fall’s gubernatorial race will be crucial in securing Arizonans’ reproductive rights. A decision from the Supreme Court that arrived the prior week, striking down a Massachusetts “buffer zone” law that protected women from intimidation when they sought services at reproductive health clinics, adds even more weight to Klein’s argument. Much is at stake both in the national election and the state election here in Arizona. Although a major change in the makeup of the legislature is unlikely, the governor’s race makes the 2014 election a critical event. Whatever comes out of the legislature, how Arizona’s next governor uses his or her veto power can mean the difference between Arizona’s continuing notoriety in the War on Women — after already enacting requirements for ultrasounds, waiting periods, and state-directed counseling for abortion patients — or health care policy that upholds reproductive rights. When Janet Napolitano held the governor’s office from 2003 to 2009, she set a record for the number of vetoes in a single session (58) and in a single term (115), and many of her vetoes kept a conservative legislature from dismantling reproductive health. In 2003, she stopped legislation that would have allowed employers to opt out of contraception coverage in their medical benefits. In 2005, she rejected legislation that gave health care providers grounds to deny emergency contraception based on personal objections. In 2004, 2006, and 2008, she vetoed bills that created more obstacles for patients seeking abortions, including one that required minors to have notarized consent from their parents before being allowed to terminate their pregnancies. In contrast, when Jan Brewer took office in 2009, she approved an abortion omnibus bill that required a 24-hour waiting period and two office visits to obtain an abortion, in addition to a mandatory discussion of services for women who decide to carry their pregnancies to term. The next year she made cuts to women’s health care, including cancer prevention care and access to birth control (the same services that women had to be told were available). In 2012, she approved a ban on abortion after 18 weeks, and this year she signed into law a bill that authorizes unannounced, warrantless inspections of abortion facilities. And there are numerous other bills she has signed into law that chip away at a woman’s access to abortion and her ability to make her own health care decisions. Recent news and recent history make one reason to vote very clear: Our reproductive freedom can’t be taken for granted. Sadly, recent history also makes it clear that having our votes counted can’t be taken for granted either. In 2012, Arizona drew national attention when thousands of ballots remained uncounted weeks after the November election. More than 600,000 ballots, mostly early and provisional ballots from Maricopa County, remained uncounted after Election Day. In Maricopa and other counties, early ballots that were received close to or on Election Day contributed to the backlog, as did provisional ballots that require verification that each voter was eligible to vote and cast the ballot in his or her correct precinct. The large backlog and the more than two weeks it took to process it generated anger, mistrust in the system, and charges that Latina and Latino voters, who had cast a high percentage of the backlogged ballots, had been targeted for disenfranchisement. To vote in August’s primary election, make sure you’re registered to vote by July 28! If you are not registered or need to change your registration, the registration deadline for the primary election is July 28, and the deadline if you want to vote in the general election is October 6. 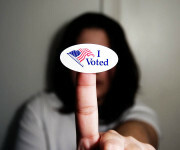 You can register to vote online by visiting the Secretary of State’s website. Our Election 101 page explains the benefits of early voting. You can request to be put on the permanent early voter list whenever you register. If you are already registered but not on the early voting list, you can contact your County Recorder to be added. Returning your early ballots as soon as you can will better ensure they are counted by Election Day. Early voting begins on July 31 for the primary election and October 9 for the general election. If you decide early voting isn’t for you, be sure to show up at your correct polling place on Election Day. You can use the Arizona Secretary of State’s website to find your polling place. Also, remember to bring ID. Your Arizona driver’s license is a reliable form of ID, but if you don’t have one, be sure to check out the Secretary of State’s website to find out what other forms of ID you can use. Taking the above steps should ensure that you don’t have to vote on a provisional ballot. Provisional ballots should be avoided if possible, since they require more scrutiny before being counted. In Arizona’s 2012 election, 19 percent of them were thrown out. However, provisional ballots are there as a fail-safe. If you’re sure of your eligibility to vote but aren’t on the voter rolls when you show up on Election Day, you should request a provisional ballot instead of turning away without voting. A provisional ballot is definitely better than no ballot. You should receive instructions with your provisional ballot, which you should carefully review and follow to eliminate the chance that your ballot will be thrown out. Keep watching the Planned Parenthood Advocates of Arizona Blog in the months to come for coverage of what’s at stake in this election and what candidates have our endorsement. Our endorsed candidates share our belief that access to sexual and reproductive health care and information is critical to the well-being of all citizens and support sexual and reproductive health care access and rights for all. This entry was posted in Elections and tagged abortion, Abortion Omnibus Bill, ACA, Affordable Care Act, Arizona, Barack Obama, buffer zone, contraception, contraceptives, counseling, emergency contraception, Ezra Klein, Hobby Lobby, Jan Brewer, Janet Napolitano, Massachusetts, SCOTUS, Supreme Court, ultrasound, veto, Vox.com, waiting period, War on Women by Matt. Bookmark the permalink.